There are a few reasons your Facebook business page may not be showing up under your "connect pages" button. If you do not see your page, try the following solutions. Make sure you are logged into MobileMonkey through Facebook with the Facebook account that is an admin of the desired Facebook page. If you are not sure, log out of MobileMonkey, log into your Facebook account in the same browser, and log back into MobileMonkey using the "Sign in with Facebook" option. Make sure you are an admin of the Facebook page. You can check that under the page's "page role" settings. Make sure the page is a Facebook business page. It cannot be a personal page or a group. 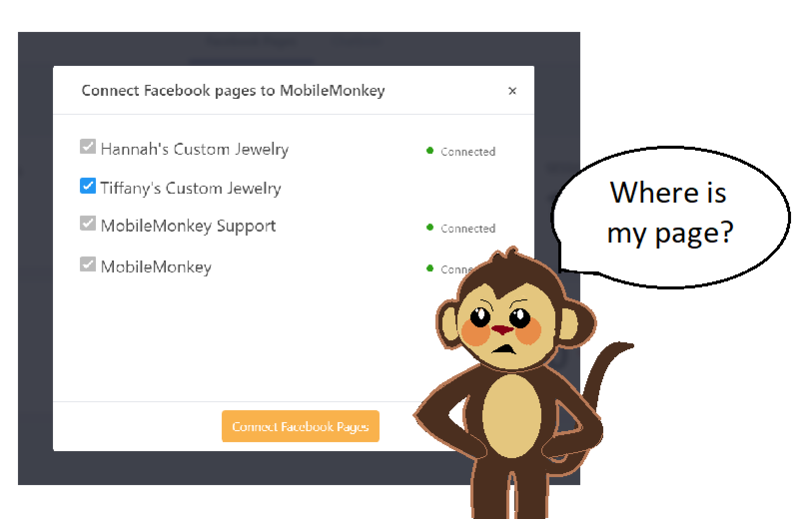 Make sure you have granted MobileMonkey access to your Facebook content. You will be prompted to do so when signing up. A popup will appear asking for permission, and you must accept. If you are not sure whether you did this, try resetting your Facebook permissions. To learn how, click here. 🍌.